As I entered my father’s quarters, the scene that greeted my eyes at once aroused my interest. In the center of the room sat my father, his head cupped in the palms of his hands, his eyes staring intently at the table. Opposite him sat a brother officer, in the same attitude. Both seemed to be thinking deeply. Neither uttered a word. The impression came upon me that this curious game must have a military significance, judging from the interest the two soldiers manifested. I then began to concentrate my mind on discovering how the pieces should be moved; and at the conclusion of the first game I felt sure that I had learned the rules for the movement of chessmen. A second game was played. By this time the wonder of an “Arabian Nights’” tale could not have held me more. I followed each move eagerly. Having solved the first mystery of chess – the movement of the pieces – I sought to find out the principles that underlie the game. Although I was only four years old at the time, I could soon appreciate the fact that a game of chess may be compared to a military battle – something that involves an attack on the part of one player, and a defense on the part of another. Action of this nature always made a deep impression upon me. I recall with what delight I used to listen to a soldier’s story of the capture of a redoubt or the trapping of an army. I believe, therefore, that my early and very strong attraction to the game of chess was due to the peculiar set of mind that I had developed as a result of my military environment, and also to a peculiar intuition. On that particular afternoon there occurred an incident which launched me upon my chess career. During the second game that my father played, I noticed that he had moved one of his knights not in the prescribed way – a move that was evidently overlooked by his opponent. I maintained a dutiful silence till the close of the game, when I called my father’s attention to what he had done. At first he was inclined to dismiss my statement with the characteristic tolerance of a father who hears something foolish issue from the mouth of his offspring. My earnest protestations, arising from the exultation of having acquired some new and interesting knowledge, and the doubtful look of his opponent, caused him to believe that he might, after all, have been guilty of deceiving the other player. He knew, however, that I had never seen a game of chess before, and he felt safe in informing me very politely that he doubted very much whether I knew anything of what I was saying. My reply was to challenge him to a game of chess. Whether he felt that I had suddenly contracted dementia, or whether he wanted to save himself from further embarrassment in the presence of his friend, I do not know; but he sat down to play me, evidently foreseeing an early capitulation on my part. When he saw that I knew how to handle the pieces, he became visibly disconcerted. When the game reached its close, I cannot say whether it was amazement, mortification, or pleasure that affected him most; for I had beaten him in my very first game of chess. After this incident, my father’s friends were profuse in their declarations that I was a boy of unusual powers. Some of them went so far as to call me a prodigy, and to predict that I should undoubtedly develop into the greatest chess master of the world. Yet, as I hark back to those days, I feel positive that I could not qualify as a child wonder. I do not recall that I was particularly blessed with the conventional accompaniments of genius, as commonly set forth in biographies – the precocious appreciation of the immensity of nature, of the beauty and complexities of the cosmos, and all that sort of thing. As a matter of fact, I cherish as one of my special accomplishments my more than ordinary ability in that very mundane but good American game of baseball. Such a thing, surely, must be foreign to genius! The persuasion of my father’s friends finally caused him to take me to a brain specialist at Havana. While every one urged that my talents as a chessplayer should be developed by a course of special training, my father much preferred that I should maintain the even tenor of the average boy’s way. To the many suggestions of my possible exploitation in the field of chess, he persistently lent a deaf ear. So to the brain specialist we went – a very odious task for me. That bespectacled and bewhiskered individual, after making an examination, announced in oracular manner that I was possessed of mental powers unusual for a boy of my age, and advised that I should be prohibited from playing chess. I was keenly disappointed, as my love for the game had become a passion. 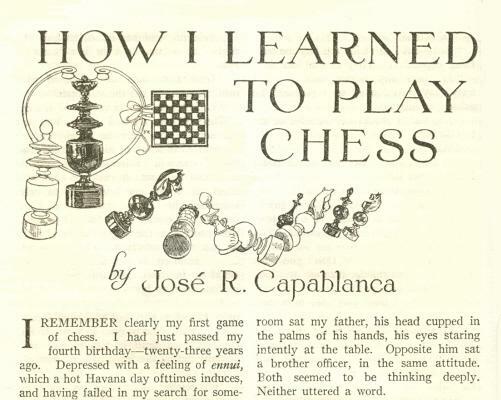 It was not until I was eight years of age that, upon the earnest solicitation of my father’s friends, he consented to take me to the Chess Club of Havana, which at that time numbered among its members several players of established reputation. Here I resumed playing, but only to a moderate degree; and I soon had the pleasure of matching myself with the club’s best players. The first game that I played with an opponent of world-wide reputation was when Taubenhaus, the famous Parisian expert, visited Havana. At that time I was just five years of age. Taubenhaus offered me a queen, and when the first game was completed he played another with the same odds. Several years ago, when I was visiting Paris, after the San Sebastián tournament, I met Taubenhaus, and in our conversation he spoke of these two games, saying that he had been under the impression that he had lost both of them. The question has frequently been asked of me, to what do I attribute my precocious start in chess? Roughly I might say that it was due partly to a mastery of the principles of the game, born of what I often felt to be a peculiar intuition, and partly to the possession of an abnormally developed memory – a memory far stronger than that of the average boy of four. I recall how the soldiers of the fort at Havana would find diversion in leading forth the clerk of the garrison – the poor wretch! – and placing him opposite me. They would then read off large sums for us to add, divide, and multiply. I would invariably offer the correct answer before the clerk could get started. Furthermore, while I do not claim that my memory then was that of a Macaulay or a John Stuart Mill, yet it is a fact that at school, after a second reading of seven pages of history, I could recite them verbatim.